"The king requests your presence in the honorable kingdom of Norwold. If you're worthy, you may be appointed lord of a dominion filled with friendly villages, sturdy fortresses, and raging bands of monsters. Well, yes, and you may have to lead your forces into a war or two. But you'll be ready for the challenge. You'll be ready for treacherous spies who conspire to steal your land. You'll be ready for a foul band of frost giants that raids your dominions. And you'll be ready for the inevitable clash of empires, the outcome of which may alter the fate of millions. You'll be ready! 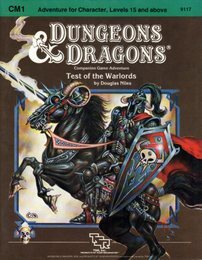 Test of the Warlords includes a complete campaign setting, several new NPCs, dungeon and wilderness encounters, and guidelines for running a war between empires." "A cloud of death hangs over the land, as an unlikely trio of evildoers orchestrates a reign of terror over the tiny Barony of Twolakes Vale. Because of these fiends' actions, hordes of undead have escaped through a gateway from the Sphere of Death, laying the peaceful lands of the barony to waste and terrorizing its citizens. Can the undead be stopped? 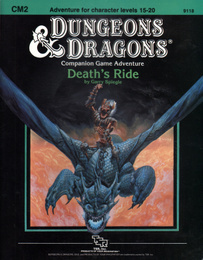 Death's Ride is an adventure designed for use with the D&D® Companion Set rules. Six player characters, levels 15 to 20, may try to stop the undead horde now pouring forth from Twolakes Vale. The party should include at least one high-level cleric, as this adventure showcases the new undead creatures from the Companion set." "Have all of your characters settled down and started dominions? Have you wondered if they'll ever get a chance to fight their way through an old-fashioned dungeon again? Yes, they will! 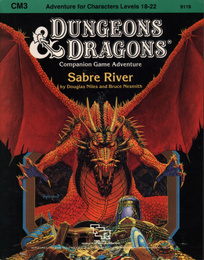 Sabre River is for four to six characters of levels 18 to 22 and is designed for use the the D&D Companion Set. Those PCs who have settled down and formed dominions or those who travel the world in search of adventure can join in the fun. The river and the land around it are cursed, and a young boy seems to be the only one unaffected. Those who try to lift the curse must first reach the Seer on his mysterious island and then brave the Tower of Terror and the adventures at the river's heart. Only the intrepid need apply! SABRE RIVER is divided into several major sections, beginning at the Count's Stronghold and ending at the Heart of the River. Each section contains a variety of encounters and adventures. Some of the sections will easily fill an evening's play, while others might be stretched over several sessions of gaming. 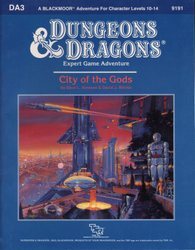 As with any module, try to read the entire adventure before beginning play. If you simply don't have time for this, at least make sure you have read the section being played before you begin. SABRE RIVER is designed to fit into an ongoing campaign. 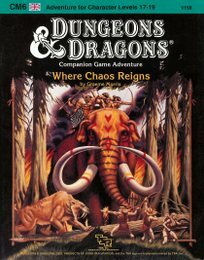 Thus, you should be able to pull the PCs from whatever they are doing, run them through this adventure, and then return them to the normal course of your campaign." "Into your hands has been thrust a great responsibility - management of a growing domain. It has been a hard winter. Now, with the coming of spring, the populace looks to you for leadership. It will take a careful and generous hand to restore your subjects' confidence. But even as you hold your first courts of the new season, an ominous shadow falls across the land. Earthshaker - wonder of the world - has arrived! Will its arrival be a curse or a blessing? With bold action and skillful diplomacy, you may yet divert disaster. But if you fail, the consequences will certainly be the subject of many a minstrel's tragic songs for years to come! 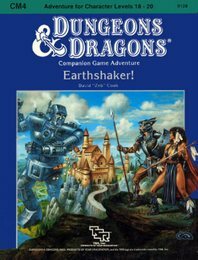 Earthshaker includes a complete dominion setting, new player characters and NPCs, and complete material on one of the greatest marvels of the world - the giant and unstoppable Earthshaker!" 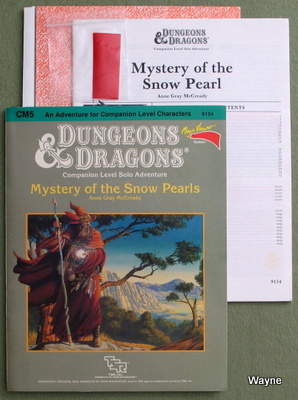 Called "Mystery of the Snow Pearl" on the title page. The map ("The Wilderness") on the 3rd panel of the cover was re-used -- encounter numbers and all -- in the adventure book of the Gamma World 3rd edition set. "One of four magical, snow white pearls protecting Tarylon has been stolen! And you, a Companion level elf, are responsible for its safe keeping. Now the very existence of your beautiful village is threatened unless you can find the powerful pearl. Milgor, the evil wizard with an evil sense of fun, challenges you to find the pearl, and return it to Tarylon. Time is running out while you try to discover and solve the riddles of Milgor in this exciting, puzzling adventure. Time is running out for Tarylon! This adventure uses the Magic Viewer system to reveal hidden encounters, puzzles, and traps." In the center are 8 pages of Pull-Outs not counted in the page numbering. You have been chosen, and Eternity beckons!" "The Feadiel clan's Tree of Life is dying. As the bravest and strongest elves in the clan, you must undertake the challenge of the elders: seek out the source of the disease and destroy it. If you fail, the Tree of Life will surely perish, and all your family with it. The quest is great and you may die on the journey, never to find the cause of the disease. The journey will take you to the deepest part of ancient Selinar, Elvenhome, to find the guarded grave of the first Treekeeper. Delay no longer! 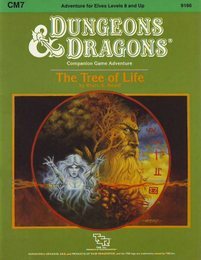 The Tree of Life grows weaker, day by day..."
"The Tree of Life is an adventure designed for a party of elves 8th level and above. This adventure is not recommended for inexperienced players. The total experience of the party of adventurers should be no more than 5,000,000 XP, with a maximum of ten player characters. Since the elves are basically limited to 10th level, it is easier to determine the party's power by using experience points rather than levels. One druid is desirable for this adventure. If none is available, the characters will be able to find an NPC druid willing to join them in Chapter 1, through an optional encounter. "The Great Mage Cheiromar, known are Aglahund the Mighty, is said to be buried under the Leaning Stone atop Galzar's Crag. One of his apprentices, Ulthorn, has been discovered dead in an aperture of the Leaning Stone...a doorway that locals swear has never been there before! You must discover how Ulthorn died and the mystery of the Leaning Stone. In the process, you may find yourself at the Endless Stair. Those who never climbed it say it seems to lead to nowhere. Those who did never lived to tell of it. Will you dare ascend into the unknown?" "Your cousin Rolph is dead - and while there is cause for sadness, there is also cause for celebration. As his heir, you were willed his dominion: Fenhold. Of course, the Deep Swamp is threatening to engulf all of your new holding. People are seeing ghosts, disappearing without reason, and crops are suddenly blighted. The farmers don't like the swampdwellers, the swampdwellers don't like the farmers, and no one likes the halflings. The entire civil service of the dominion seems to have either worked for the failure of the dominion or resigned due to actions of the others. It's going to be a tough task to make all this shipshape once again, but you're 15th level now. Isn't it about time you settled down?" Dave Arneson's classic campaign of Blackmoor got a brief run in 1986-7. On every side the storm clouds gather. To south and east, the Great Empire of Thonia plots to end Blackmoor's independence and reclaim its lost province. To the west, the implacable Afridhi are on the move. To the north, the evil Egg of Coot prepares to cross the thundering sea and once again bring fire and sword into the heart of the small kingdom. Beyond the realm of the Egg, the hated Skandaharian Raiders are building longships and preparing to fall upon Blackmoor's unprotected coast while its tiny army turns to meet these other threats. Into this time of black despair, there steps a band of adventurers who clutch strange swords and wear most curious armor - and who claim that Blackmoor sank beneath the ice 3,000 years ago!" This module is the second in a series of adventures set in the mythical kingdom of Blackmoor. 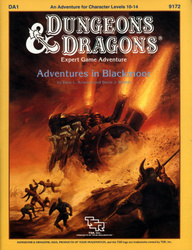 Blackmoor was the first campaign setting ever created for use in a fantasy role-playing game. 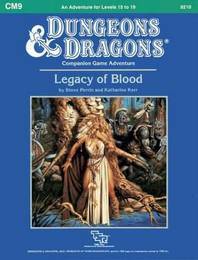 The Blackmoor presented in this module is a substantially revised and expanded setting based on material developed for that venerable campaign. In view of this fact, it is perhaps fitting to note that the events, places, and characters resident in Blackmoor exist some 3,000 years before those described in any other D&D® fantasy role-playing game material. 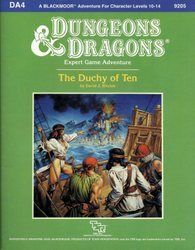 The adventure in this module is designed for a party of five to eight player characters (PCs) of the 10th to 14th levels of experience. Among those who have dropped from sight in the arboreal hell is young Risa Aleford, one of Blackmoor's most important leaders. Carried off to the sinister City of the Frog, she is now being held by the eccentric Monks of the Swamp. By making the baroness captive, the deranged monks have seriously weakened Blackmoor at a time when enemies already threaten it from all sides. Yet, even as the froggies gloat, the king of Blackmoor dispatches a small band of bold adventurers to the rescue. Deep into the Great Dismal Swamp they must go - far from sunlight and sanity - there to seek and save the captive baroness from the foul Monks of the Swamp. 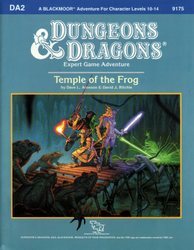 There to find - the Temple of the Frog." That's what the flying egg has. New magic unlike any ever encountered in Blackmoor. New magic of a type that could give the fledgling kingdom an important edge in the wars that are brewing on its borders. There are only a few minor problems. Like the fact that the magician who piloted the metal egg to one of Blackmoor's southern outposts was killed before he could utter a word. And the fact that Blackmoor's sworn enemies, the monks of the evil and eccentric Order of the Frog, are also interested in the magic represented by the egg. And, most important, the fact that the egg came from the distant and dangerous City of the Gods. Set amidst the blistered salt flats of the Valley of the Ancients, the City of the Gods is a strange and deadly metal metropolis whose powerful guardians do not welcome intruders. Yet it is to this place of deadly menace that Blackmoor's leaders now send a daring expedition - to bargain for aid in the coming wars - or to steal the magic of the gods." That's what Zugzul bade the Afridhi call the evil artifact that he had taught them to make. They must call it the Well of Souls, and they must carry it before them into every battle - and they would be mighty. Thus said the god of Afridhi, Zugzul the One. So the Afridhi did as they were bade. Seeking the volcano called the Hill of the Hammer in the far Barrens of Karsh, they built in its heart a great forge. There, as Zugzul had promised, efreet came to help them make the mighty artifact. There, amid vile, unholy rites, they bound the souls of men into its very substance, and, as it took shape, they sharpened their swords for the red-handed work that must surely follow hard upon its completion. Many were the men who guarded the Hill of the Hammer during the days of making - for their foes in hated Blackmoor would try to unmake that which they had wrought. Yet, it was not men that would keep the Well of Souls from destruction, but a prophecy - that the artifact would be unmade only by the hand of one as yet unborn!" And simply everyone is going to the magnificent VILLA OSTEROPOLUS, home of the wealthy old senator, Helenites. Raucous fun, exotic food, and even advanced betting on the upcoming Arena games are expected. Even adventurers just in from the outlands may meet the powerful here. So don your festive togas, for in Thyatis City there are important connections to be made and deeds to be done, duels to be fought and fame to be won. This module is designed especially for the DM who want to sharpen his interactive skills. 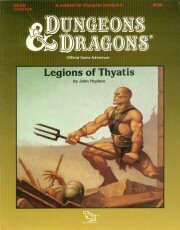 * Featuring The DM's Guide to Winging It"
The corrupt Thyatian senator, Helenites Osteropolus, his latest scheme smashed by the adventurers and their gladiator allies, hatches a new plot to destroy the influence of the Order of the Sands (even, perhaps, to attack the Emperor himself!). Yet greater dangers lie ahead. If his plot succeeds, it will remove the guardians that protect the city from the creatures that lurk in the caverns and catacombs below. Can the players block his gambit? Will the wheels of justice grind small, or will the greasy palm of political corruption reach out and save the senator once again? YOU decide, in the chaotic swirl of the Thyatian capital's politics. This module is designed especially for the DM who wants to sharpen his interactive skills. * New information on the military Legions of Thyatis. 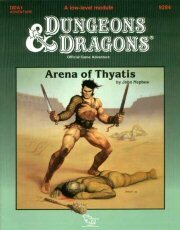 * This module is a stand-alone sequel to DDA1 Arena of Thyatis"
"POWERFUL MAGICS ARE LOOSE IN KARAMEIKOS! You and your companions are starting on your first adventure and you've been swept into the intrigues surrounding the infamous Black Eagle Barony. 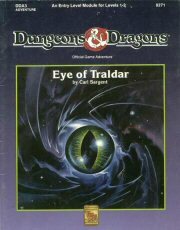 To prevent the evil Baron von Hendricks from gaining more power, you and your companions must retrieve the magical Eye of Traldar from the wizard's tower at Fort Doom. Can you escape the clutches of the armed garrison? Will the Baron gain the powerful artifact and use it for evil? YOU and your friends make the choices and affect the entire Grand Duchy of Karameikos. This module is particularly recommended for novice Dungeon Masters and players who want to try their hand at overland adventuring. 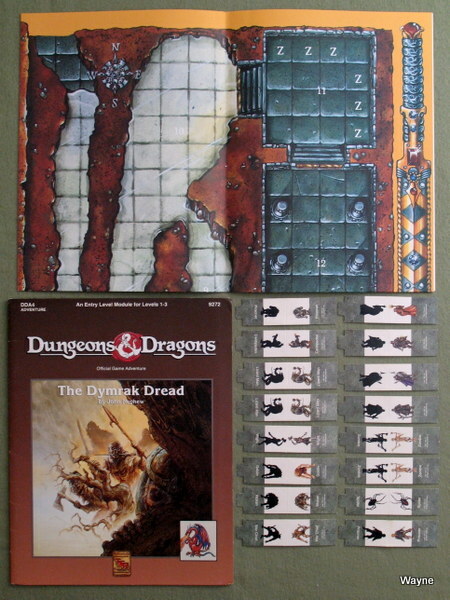 * Adventure in the monster-filled caverns and dungeons beneath Fort Doom." "Are you ready to meet the Lord Forester's challenge: to put an end to the needless death and destruction by doing away with the goblin war chieftain, Kosivikh, and his evil band of raiders? Eager to prove yourselves as new adventurers and to collect a sizable bounty, you travel to the goblins' dungeon in the Dymrak Forest - a place that has captivated your interest for years, a place where few have dared to venture. Only you and your fellow adventurers can put an end to the rampant bloodshed and return peace to the territory. 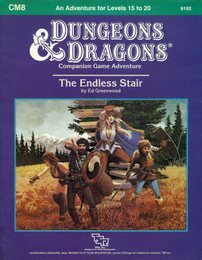 This module is recommended especially for beginner Dungeon Masters and players who are interested in dungeon exploration. * Features easy-to-follow rules on dungeon adventuring in the heart of the Dymrak Forest"